In the heart of the Loire Valley, in the city center of Tours, the hotel has many benefits for business or leisure stays. 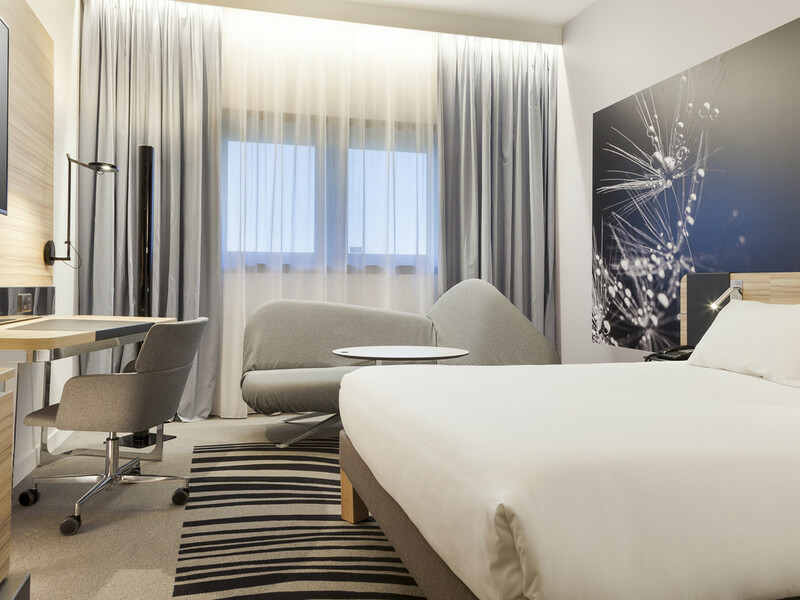 The TGV train station and International Convention Centre is just a few steps away. Discover shopping, historic districts and the famous Plumereau Square. The perfect stopover for visiting the Loire castles The hotel's restaurant offers traditional cuisine in a modern, musical setting. In the heart of the city, discover Tours and Place Plumereau with its famous half-timbered houses. Stroll along the Loire - Europe's last wild river - classified as a UNESCO World Heritage site. Enjoy the chic, modern decor and musical ambiance while you take your time to try the traditional dishes on the menu, or discover the burgers, salads and pasta dishes on our snack menu. Discover our cocktail menu and sample a Picas Picas plate in a musical atmosphere. Excellent location close the the tram line and so only minutes from the centre of town. Staff were friendly and helpful. Only criticism is that the bar was usually empty and we had to go to reception to ask for someone yo serve us. No welcome gift for gold member, only 1 drink is allowed for welcome drink despite there’s two of us. Put on ‘do not disturb’ sign on the door yet housekeeping was making up the room when we got back. My room was large and very nice. Unfortunately it had just been renovated and the smell of paint was a bit much. My room was just opposite the elevators and a bit noisy for that reason. Everything was clean and there is a safe and refrigerator in the room. The sink in the bathroom is very modern but it offers minimal clearance between the faucet and the basin. This hotel attracts tour groups and there was almost always a bus right next to the front door. It is a very nice hotel. However, I was quite disapointed when I discovered that the gymn was not opened yet, although the web site said it was. It was the main reason I chose this hotel. Dear Woody666, Thank you for your nice comment. Hope to see you the next time in Tours ! Best Regards. Airconditioning on the 7th floor very bad! Makes you sweat! After the check in, we mentioned that the aircondition was off. I turned it on. After 1 hour no tempreture change. I talked to the female receptionist about the aircon. problem. She informed me that the mechanic/technition is already home and the hotel is fully booked, no other room avaliable. I checked the accor website and booking.com. There were still rooms to book. During our 24h stay nothing hss changed concerning the temperature in the room. The cooling system is to old for the 7thfloor. We slept wirh open windows and very noisy street!!! Though we were totally exhaused for our travel to Larochelle. No good experience with Novotel Tours!! We stayed here on a short 4 night break. The hotel is well situated for the centre of town. As ever, rooms are clean and comfortable. Restaurant is good and there are also plenty of restaurants close by if you fancy a change. What really stand stands out though are the staff; reception, restaurant and cleaning are all really friendly and helpful. It makes the stay so much nicer so big thanks to all of them. Dear EnglishinFrejus, Thank you so much for this lovely comment ! Hope to see you while your next time in Tours , Best Regards. The hotel is right in front of the train station with some free parking areas. The room is cleaned and comfortable to sleep. However, quality of breakfast is quite low. It is much below our expectation. I would not recommend others to stay here. It is not valued for money.